It may be asking too much of the numbers to convince everybody. “The debate over abortion and crime will not be resolved within the parameters of our paper,” says Mr Donohue. He thinks the arrest figures are “muddy” and the state population data “sloppy”. Combining the two generates so much noise, it is hard for the statistical tests to hear anything. Ted Joyce, a professor at Baruch College (part of the City University of New York), who has had his own methodological disagreements with Messrs Donohue and Levitt, also thinks the debate is stretching the data too far. He points out that if you add controls for 50 states and 12 years—as Messrs Foote and Goetz do, and as Messrs Donohue and Levitt meant to do—you are, in effect, holding another 600 things constant. This robs the data of most of their variety, and of much of their ability to explain anything. There was no warning that these were the wrong tests at all in either of their previous papers or in Levitt's book. Levitt now refers to the “collage of evidence," but the panel data was the only test that really amounted to anything worthwhile. The rest of the data was merely cross sectional or time series. A single store that sells: guns, ammo, liquor, cigarrettes, and food, plus a sign out front that says "May God Bless Our Freedom." You gotta love Texas. UPDATE: It was pointed out to me by an anonymous commentor that the sign also mentions the Texas state lotto, so there is also gambling! 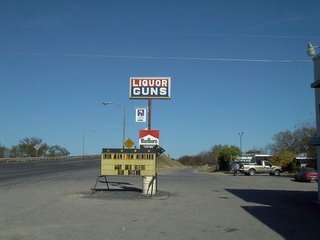 This picture is from Uvalde, Texas. It is interesting how this scientist treats the results on forests. If the same results were found for it seems anything else, I wonder whether he would still like that item. Well, at least he seems to understand the notion of trade-offs. Canada's forests may actually be worsening global warming rather than cooling the planet, says a controversial study by a Stanford University physicist and environmental scientist . . . Trees are designed to soak up massive amounts of energy from the sun. Much of this, he argues, is gradually released in the form of heat, especially in dark evergreen forests in the north, but also in temperate forests of maple, poplar and beech. Unlike tropical forests, Canadian forests don't release much cooling moisture. . . .
That said, Mr. Caldeira still wants forests protected for other reasons. "I like forests. They provide good habitats for plants and animals," he said. . . .
Monday's agenda -- the first day of debate in the young session -- lists two contentious issues that promise to elicit emotional debate: a bill allowing Nebraskans to carry concealed weapons and a measure to make it a crime to assault a fetus. Senator Jeanne Combs, sponsor of the concealed weapons measure (LB454), has been waiting to resume debate on her bill since she agreed to table it last session on the promise of Speaker Kermit Brashear to schedule it for early debate this year. Combs says she's eager to debate her bill. . . .
Foxnews has a very interesting story. Drudge seemed to break the Dems plan first, but Fox had this follow up about how the plan had the plug pulled. Someone who compares "animals killed for food to victims of the Holocaust" will face some credibility problems in going after Alito. A key witness to the character of Judge Samuel A. Alito has been removed from the Senate Judiciary Committee Democrats' testimony list, FOXNews.com has learned. Stephen R. Dujack, editor of The Environmental Forum magazine and fellow Princeton University alumnus, was expected to testify about a controversial student organization that counted Alito as a member. Dujack confirmed to FOXNews.com late Friday that he was no longer testifying, but said he could not elaborate. A spokesman for Texas Republican Sen. John Cornyn, a committee member, said he had been notified of the list change shortly before 7 p.m. EST. Earlier on Friday, Cornyn's office circulated a 2003 Los Angeles Times editorial in which Dujack compared animals killed for food to victims of the Holocaust. Whether the editorial factored into the decision to drop Dujack from the witness list was not clear. Democratic committee members said as recently as Thursday that they were looking forward to answers regarding Alito's membership in the now-defunct Concerned Alumni of Princeton (CAP). CAP was formed not long after Princeton began to admit women, and was critical of affirmative action admissions policies. Dujack and other critics of CAP accused the organization's leadership of racism, sexism and "dirty tactics." . . .
Schumer exaggerating cell phone record risk? Given that this is being pushed by Senator Charles Schumer and given how much he hypes the gun issue, I have my strong doubts about the accuracy of these claims. I don't know anything about this question regarding cell phones, but I know about Schumer and his false claims everything from terrorists getting guns at gun shows to you name it regarding guns. However, I will bet that this will get a lot of attention. Some online services might be skirting the law to obtain these phone lists, according to Sen. Charles Schumer (D-N.Y.), who has called for legislation to criminalize phone record theft and use. . . .
FT: "Europe hit by rise in brutal bank robberies"
Banks in the European Union are robbed at a rate of one every 90 minutes, according to a new report that also highlights the increasing brutality of raids. . . .
Another cause for concern is the “increase and intensity of violence in the attacks against security transports: organised gangs operating across borders use any means available to them, including heavy weapons and explosives,” the report states. The survey adds that the rise in violence is likely to continue: “It is to be feared that criminals will resort to higher levels of violence to arrive at their aims. Indeed, the increasingly higher investment by banks as regards branch security forces criminals to find other means to get at the money.” . . . Thanks to John WIlliamson for sending this to me.
. . . the event cost more than $1.9 million, even though campaign reports at the time put the price tag at about $500,000. As part of the agreement, the actual cost is now put at $1.2 million, with almost $400,000 unreported for the cost of producing the concert, and nearly $100,000 unreported for travel and lodging costs. This allows Hillary to have more than $700,000 in hard money for TV ads that she otherwise wouldn't have had. The National Republican Senatorial Committee said yesterday that almost all Senate Democrats have accepted money from scandal-plagued lobbyist Jack Abramoff, his associates or his Indian tribe clients. "I think Democrats might want to be a little bit careful before they start pointing fingers," said Sean Spicer, spokesman for the House Republican Conference. "This is something that has ensnared both parties." The Senate campaign committee said 39 of the Senate's 44 Democrats, plus Democrat-leaning independent James M. Jeffords of Vermont, have taken funds from Abramoff, directly or indirectly. . . .
Second, I listened to C-SPAN's coverage of McCain's hearings on Abramoff yesterday and I have no clue what the problem was. The claim was that a woman would tell Abramoff about conversations that she had with Interior department officials, and that Abramoff said that this information was valuable. In addition, Abramoff had Indian groups make donations to this woman's organization. The point being what? I had no idea what the crime was in what was being discussed. More than three-quarters of Toronto residents believe lenient judges are allowing gun crime to flourish in Canada's cities, according to a poll conducted on behalf of the National Post and Global News. . . .
Eighty-nine per cent of Toronto residents polled blamed gangs for the shootings that have made gun crime a top issue in the federal election campaign while 78% cited drugs and drug trafficking. . . . I have just put my first posting up at the Committee for Justice Blog. It is on the ABA's high rating given to Alito. Other interesting information on Alito's confirmation can be found here at NRO. "How's This For Anti-Gun Bias?" Jeff Soyer has a nice example of bias against guns in the Wisconsin media. The fight to allow Nebraskans to carry concealed weapons is now a decade old, but Sen. Jeanne Combs believes it will be passed in the upcoming legislative session. Combs, a card-carrying member of the National Rifle Association, introduced her concealed-weapons measure (LB454) last year. It was passed out of committee and sent to the floor for debate, but with the legislative session waning, she made a deal with Speaker Kermit Brashear of Omaha to pull the measure from the agenda. In return, Brashear committed to scheduling the concealed weapons measure "for full and fair debate" at the beginning of the looming session, which starts Wednesday. "I look forward to that discussion and debate and fully expect that the bill will be enacted by the Legislature and signed into law by the governor," Combs said. In an Associated Press pre-session survey, 26 of 49 senators said they would favor allowing Nebraskans to carry concealed weapons, while five said they were leaning that way. Eight were opposed to the idea and two were leaning that way. Four were undecided and three did not answer the question. One senator did not participate in the survey. . . .
My Review of Paxton Quigley's new book, "Stayin' Alive." WHAT should a woman do when attacked by a criminal? Should she behave passively? Use pepper spray? A gun? Most people hope they'll get lucky and never be attacked. For those who want to think ahead, there is Paxton Quigley's new book, "Stayin' Alive." . . .
"McDonald's worker suspended for shooting at robber"
Friday, Dec. 30, 2005 NEW ALBANY, Ind. A McDonald's maintenance worker who pulled out his gun and fired two shots at a woman who was robbing another employee at gunpoint has been suspended from his job. While police officials say Clifton Brown Jr. violated no laws last week when he fired the shots shortly after the restaurant's midnight closing, the franchise owner said Brown violated a ban on guns at the restaurant. The shooting happened as Brown and a co-worker were taking out the trash and a woman, who was on foot, put a gun to the back of the second employee. She then robbed the restaurant in the city just north of Louisville, Ky., through the drive-up window, police said. Brown told police that he pulled his gun out and ordered the fleeing robber to stop. She then raised her own gun and he fired two shots, which apparently missed the woman, before she continued to flee. . . . Restaurant owner Ron Vanover said Thursday that Brown had been suspended from his job while the shooting was being reviewed. He said he considered Brown's actions inappropriate. "I think that's common sense," Vanover said. "Money can be replaced; lives cannot." Brown could not be located for comment as no home telephone number in the New Albany area was listed in his name. Please see this write up by Brian Blase about what is the safest course of action to take in a robbery. This is one case where people might consider letting McDonalds know about whether they are right to suspend this employee. Again, there is also the issue of deterrence. Would more people rob this store in the future if they thought that employees might be armed.